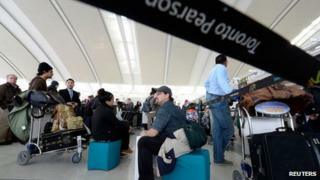 Canada's electronic spy agency collected data from travellers passing through a major airport, the Canadian Broadcasting Corporation (CBC) reports. The CSEC collected information captured from unsuspecting passengers' wireless devices by the airport's free wi-fi system over two-weeks, the report says. The CSEC (Communications Security Establishment Canada), in a statement to CBC, reiterated that it is "mandated to collect foreign signals to protect Canada and Canadians. "And in order to fulfil that key foreign intelligence role for the country, CSEC is legally authorised to collect and analyse metadata." Metadata is the information about a communication - such as the date and location of a call or email - rather than the details of what was actually said or written. The leaked document indicates the 2012 passenger tracking operation was a trial run of a powerful new software programme being developed jointly with the US's National Security Agency (NSA), CBC reports. Experts told the broadcaster that information captured from travellers' devices would have enabled the agency to track them for a week or more as they showed up in other wi-fi "hot spots" around Canada, such as other airports, hotels or restaurants. Such was the volume of data that CSEC could even track the travellers' movements back to the days before they arrived at the airport, the experts say. Two airports - Vancouver and Toronto - and Boingo, an independent supplier of wi-fi services at other Canadian airports, have denied any involvement in supplying wi-fi information. Edward Snowden, a former NSA contractor, is currently living in Russia having fled the US in May 2013 after leaking thousands of documents that revealed extensive internet and phone surveillance by the US and other intelligence services.